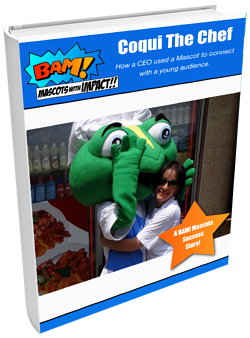 Coqui The Chef - How a CEO Used a Mascot to Connect With a Young Audience. Are you ready to take your brand marketing to the next level? Discover how a mascot can help build audience engagement, and turn your company's brand into a recognized and loved entity. In this complimentary eBook, you will read all about Tania & Coqui's adventure! Tania, the CEO of her own company, used a custom mascot to engage children and take her organization to new heights. Simply fill out the form to receive your free download of our eBook today!